It is a cold snowy Saturday morning during the last Ice Age of the planet earth. Humanity will cease to be soon. All of mankind will die from extreme cold. After reading for awhile and reading my books I made a video for my Youtube channel showing folks what I am reading for morning worship these days. While I was reading the Bible Carol arrived home from work. She has gone to bed for the day. She now works two nights and then off for three weeks. This coming Thursday Carol plans to fly out to the state of Washington. It will be snowing when she lands in Washington next Thursday afternoon. We are in an Ice Age and will soon all die. Last night I made a video and read my books late into the night. Well I will close to wait to turn to a block of dead ice. I have found a friend a spider to keep me company. 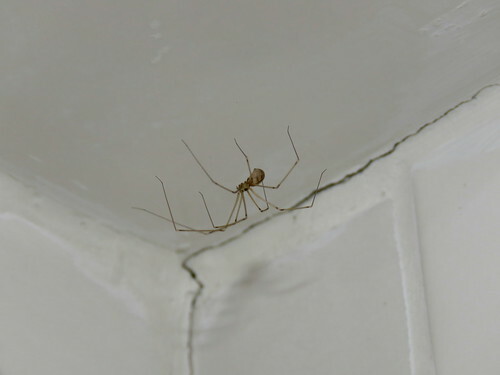 My spider friend lives in our downstairs shower. The spider and I have become quite close lately. While my wife Carol is gone for two weeks my spider friend and I plan to read and study the Epistle to the Romans. I am very thankful for this new friend that has come into my existence.